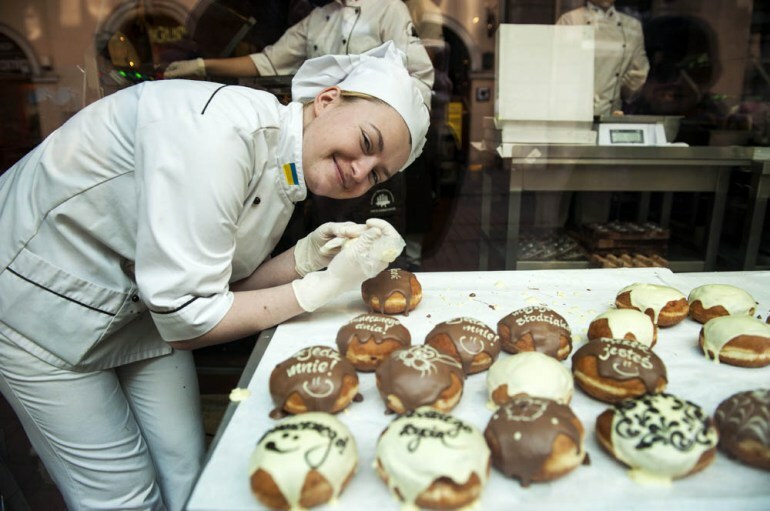 Every February, Poland goes nuts for doughnuts. Fat Thursday, the last Thursday prior to Ash Wednesday and the beginning of Lent, is one of the most important holidays, and it mainly revolves around eating as many doughnuts as possible, all in the name of good luck. Statistically, every Pole eats two and a half doughnuts ‒ or pączki, in Polish ‒ on that day, which constitutes a whopping 100 million for the entire nation. In the most famous pastry shops (Zagoździński in Warsaw or Michałek in Kraków) people queue up to purchase these balls of fried dough, traditionally filled with rose jam or plum preserve. Poland’s love affair with doughnuts dates back to the 16th century. Back then pączki were known as kreple (from German: Krapfen). In the 18th century historian Jędrzej Kitowicz, author of the fascinating treaty Description of Customs during the Reign of August III, described modern doughnuts eaten at the court as ‘fluffy and light’, comparing them to the old-fashioned ones which could give someone a black eye when thrown at their face, and therefore proving that whilst the tradition has lasted the recipe has still evolved. The Polish language also indicates that doughnuts hold a special place in Polish hearts. There exist several proverbs and idioms about pączki, the best known of which is ‘live like a doughnut in butter’, meaning to live in clover. Another – far less known and far more vivid – is the warning: ‘those who don’t eat a stack of pączki on Fat Thursday will have an empty barn and their field destroyed by mice’. As the last proverb indicates, doughnuts are believed to bring happiness, and refusing to eat them is considered not only rude, but also unlucky. Accordingly, contemporary Polish pastry chefs endeavour to cater even to vegan or gluten-intolerant doughnut-lovers. Even though the traditional recipe calls for lard, eggs, wheat flour, and loads of sugar, new variations are created for every possible dietary restriction. Fillings also vary: the traditional rose preserve can be replaced with vanilla custard or chocolate ganache. The only rule is to make them light and fluffy, which is only achieved when the yeast dough is properly aerated. As it often happens with recipes that are considered ‘traditionally Polish’, there is some cultural controversy. 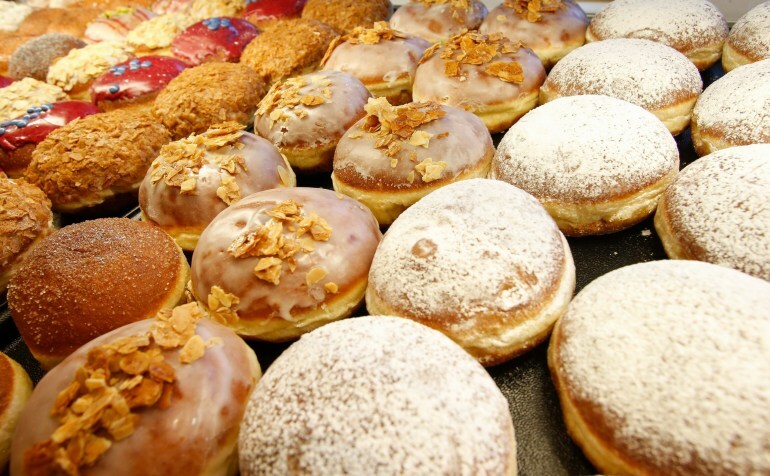 For example, some people argue that pączki are merely Berliner Pfannkuchen, sometimes known as Berliners (famous for a John F. Kennedy controversy: an urban legend states that when saying ‘Ich bin ein Berliner’, instead of ‘Ich bin Berliner’ during his visit to West Berlin in 1963, the American president called himself a ‘jelly doughnut’ and not a ‘citizen of Berlin’, therefore causing a lot of laughter between native speakers; this is not true, since people from Berlin only use the name Pfannkuchen to describe these pastries). Indeed, the differences between them are minimal (like the ratio of flour in the dough or the time spent frying in fat), but so is the difference between Berliners and the Italian bomboloni or the Dutch oliebollen. With traditional recipes, there's rarely a need for definitive appropriation. What matters is the role a dish plays in a nation's collective imagination – and pączki are very dear to Poles. They are so beloved that the good old American ‘donut’ never became popular in Poland (contrary to cupcakes and muffin, which took the country by storm). It might be the hole in the middle: Poles like to get their money’s worth. Dunkin' Donuts, the most famous American doughnut café, opened in Warsaw for the first time in 1996 – right in the middle of the nineties fast-food era, when Poles dived right into the wonderful fat- and carb-driven world of McDonald's, Burger King, Pizza Hut and Taco Bell – but six years later the American-donut-experiment came to an end. They are currently attempting a comeback with more European flavours like Nutella and plum, but it is too early to tell if they will be successful. In the United States and Canada, Pączki Day is celebrated in cities with a sizeable Polish diaspora, like Chicago, Michigan, Detroit, and Windsor, but the sweets treats are eaten on Shrove Tuesday (or Fat Tuesday) rather than on Fat Thursday like in the old continent. The pączki craze spread across the Detroit river. Windsor, Ontario, remains the Canadian capital of pączki. In places such as Nana's Bakery you can not only taste the traditional version, but also a local low-calorie version called lowczki. Drivers in Michigan better get ready to loosen their belts. For Fat Tuesday this year, 108 billboards across the state are tempting motorists to indulge in the twice-fried, pre-Lenten treats called paczkis. (...) local officials, an NFL football player and a team of ice skaters helped kick off the media event designed to call attention to the rich pre-Lenten treats.